The Alvarez hypothesis posits that the mass extinction of the dinosaurs and many other living things during the Cretaceous–Paleogene extinction event was caused by the impact of a large asteroid on the Earth. Prior to 2013, it was commonly cited as having happened about 65 million years ago, but Renne and colleagues (2013) gave an updated value of 66 million years. Evidence indicates that the asteroid fell in the Yucatán Peninsula, at Chicxulub, Mexico. The hypothesis is named after the father-and-son team of scientists Luis and Walter Alvarez, who first suggested it in 1980. In March 2010, an international panel of scientists endorsed the asteroid hypothesis, specifically the Chicxulub impact, as being the cause of the extinction. A team of 41 scientists reviewed 20 years of scientific literature and in so doing also ruled out other theories such as massive volcanism. They had determined that a 10–15 km (6–9 mi) space rock hurtled into earth at Chicxulub. For comparison, the Martian moon Phobos is 11 km (7 mi) and Mount Everest is just under 9 km (5.6 mi). The collision would have released the same energy as 100,000,000 megatonnes of TNT (4.2×1023 J), over a billion times the energy of the atomic bombs dropped on Hiroshima and Nagasaki. A 2016 drilling project into the peak ring of the crater strongly supported the hypothesis, and confirmed various matters that had been unclear until that point. These included the fact that the peak ring comprised granite (a rock found deep within the earth) rather than typical sea floor rock, which had been shocked, melted, and ejected to the surface in minutes, and evidence of colossal seawater movement directly afterwards from sand deposits. Crucially the cores also showed a near complete absence of gypsum, a sulfate-containing rock, which would have been vaporized and dispersed as an aerosol into the atmosphere, confirming the presence of a probable link between the impact and global longer-term effects on the climate and food chain. In 1980, a team of researchers led by Nobel prize-winning physicist Luis Alvarez, his son, geologist Walter Alvarez, and chemists Frank Asaro and Helen Vaughn Michel discovered that sedimentary layers found all over the world at the Cretaceous–Paleogene boundary (K–Pg boundary, formerly called Cretaceous–Tertiary or K–T boundary) contain a concentration of iridium hundreds of times greater than normal. Iridium is extremely rare in the Earth's crust because it is very dense and has the affinity for iron that characterizes the siderophile elements (see Goldschmidt classification), and therefore most of it sank into the Earth's core while the earth was still molten. The Alvarez team suggested that an asteroid struck the earth at the time of the Cretaceous–Paleogene boundary. Previously, in a 1953 publication, geologists Allan O. Kelly and Frank Dachille analyzed global geological evidence suggesting that one or more giant asteroids impacted the Earth, causing an angular shift in its axis, global floods, fire, atmospheric occlusion, and the extinction of the dinosaurs. There were other earlier speculations on the possibility of an impact event, but without strong confirming evidence. The evidence for the Alvarez impact hypothesis is supported by chondritic meteorites and asteroids which contain a much higher iridium concentration than the Earth's crust. The isotopic ratio of iridium in meteorites is similar to that of the Cretaceous–Paleogene boundary layer but significantly different from the ratio in the Earth's crust. Chromium isotopic anomalies found in Cretaceous–Paleogene boundary sediments are similar to that of an asteroid or a comet composed of carbonaceous chondrites. Shocked quartz granules, glass spherules and tektites, indicative of an impact event, are common in the Cretaceous–Paleogene boundary, especially in deposits from around the Caribbean. All of these constituents are embedded in a layer of clay, which the Alvarez team interpreted as the debris spread all over the world by the impact. The location of the impact was unknown when the Alvarez team developed their hypothesis, but later scientists discovered the Chicxulub Crater in the Yucatán Peninsula, now considered the likely impact site. 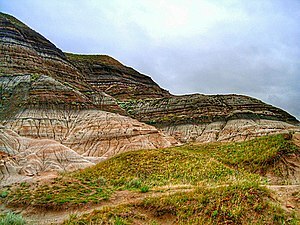 Badlands near Drumheller, Alberta where erosion has exposed the K–Pg boundary. Using estimates of the total amount of iridium in the K–Pg layer, and assuming that the asteroid contained the normal percentage of iridium found in chondrites, the Alvarez team went on to calculate the size of the asteroid. The answer was about 10 kilometers (6 mi) in diameter, about the size of Manhattan. Such a large impact would have had approximately the energy of 100 million megatons, i.e. about 2 million times as great as the most powerful thermonuclear bomb ever tested. Paul Renne of the Berkeley Geochronology Center has reported that the date of the asteroid event is 66,038,000 years ago, plus or minus 11,000 years, based on the radioactive decay of argon. He further posits that the mass extinction of dinosaurs occurred within 33,000 years of this date. The most easily observable consequence of such an impact would be a vast dust cloud which would block sunlight and prevent photosynthesis for a few years, an event called an impact winter. This would account for the extinction of plants and phytoplankton and of all organisms dependent on them (including predatory animals as well as herbivores). But small creatures whose food chains were based on detritus would have a reasonable chance of survival. It is estimated that sulfuric acid aerosols were injected into the stratosphere, leading to a 10–20% reduction of solar transmission normal for that period. It would have taken at least ten years for those aerosols to dissipate. Global firestorms may have resulted as incendiary fragments from the blast fell back to Earth. Analyses of fluid inclusions in ancient amber suggest that the oxygen content of the atmosphere was very high (30–35%) during the late Cretaceous. This high O2 level would have supported intense combustion. The level of atmospheric O2 plummeted in the early Paleogene Period. If widespread fires occurred, they would have increased the CO2 content of the atmosphere and caused a temporary greenhouse effect once the dust cloud settled, and this would have exterminated the most vulnerable survivors of the "long winter". The impact may also have produced acid rain, depending on what type of rock the asteroid struck. However, recent research suggests this effect was relatively minor. Chemical buffers would have limited the changes, and the survival of animals vulnerable to acid rain effects (such as frogs) indicate this was not a major contributor to extinction. Impact hypotheses can only explain very rapid extinctions, since the dust clouds and possible sulphuric aerosols would wash out of the atmosphere in a fairly short time — possibly under ten years. Although further studies of the K–Pg layer consistently show the excess of iridium, the idea that the dinosaurs were exterminated by an asteroid remained a matter of controversy among geologists and paleontologists for more than a decade. Amongst others, Charles B. Officer and Gerta Keller have been critical of the theory. The extinctions occurred gradually, not instantaneously "Even if a meteoric impact occurred at K-T time, it simply could not explain the extinction record." In 2016, a scientific drilling project drilled deep into the peak ring of the Chicxulub impact crater, to obtain rock core samples from the impact itself. The discoveries were widely seen as confirming current theories related to both the crater impact, and its effects. They confirmed that the rock composing the peak ring had been subjected to immense pressures and forces and had been melted by immense heat and shocked by immense pressure from its usual state into its present form in just minutes; the fact that the peak ring was made of granite was also significant, since granite is not a rock found in sea-floor deposits, it originates much deeper in the earth and had been ejected to the surface by the immense pressures of impact; that gypsum, a sulfate-containing rock that is usually present in the shallow seabed of the region, had been almost entirely removed and must therefore have been almost entirely vaporized and entered the atmosphere, and that the event was immediately followed by a huge megatsunami (a massive movement of sea waters) sufficient to lay down the largest known layer of sand separated by grain size directly above the peak ring. These strongly support the hypothesis that the impactor was large enough to create a 120 mile peak ring, to melt, shock and eject basement granite from the midcrust deep within the earth, to create colossal water movements, and to eject an immense quantity of vaporized rock and sulfates into the atmosphere, where they would have persisted for a long time. This global dispersal of dust and sulfates would have led to a sudden and catastrophic effect on the climate worldwide, large temperature drops, and devastated the food chain. ^ Schulte, P.; et al. (2010). "The Chicxulub Asteroid Impact and Mass Extinction at the Cretaceous-Paleogene Boundary". Science. 327 (5970): 1214–1218. Bibcode:2010Sci...327.1214S. doi:10.1126/science.1177265. PMID 20203042. ^ a b c Alvarez, L.W. ; Alvarez, W.; Asaro, F.; Michel, H. V. (1980). "Extraterrestrial cause for the Cretaceous–Tertiary extinction". Science. 208 (4448): 1095–1108. Bibcode:1980Sci...208.1095A. CiteSeerX 10.1.1.126.8496. doi:10.1126/science.208.4448.1095. PMID 17783054. ^ Kelly, A. O.; Dachille, F. (1953). Target: Earth – The Role of Large Meteors In Earth Science. Carlsbad, California. ^ "Early Ideas About Impacts and Extinctions". Archived from the original on 2013-02-15. Retrieved 2013-02-09. ^ De Laubenfels, M. W. (1956). "Dinosaur Extinctions: One More Hypothesis". Journal of Paleontology. 30 (1): 207–218. JSTOR 1300393. ^ Perlman, D. (8 February 2013). "Dinosaur extinction battle flares". SF Gate. Retrieved 2013-02-08. ^ De Palma, Robert A.; et al. (1 April 2019). "A seismically induced onshore surge deposit at the KPg boundary, North Dakota". PNAS. doi:10.1073/pnas.1817407116. ^ Hou, Chia-Yi. "Animals in North Dakota Died from Chicxulub Asteroid in Mexico". www.the scientist.com. LABX media group. Retrieved 4 April 2019. ^ Ocampo, A.; Vajda, V.; Buffetaut, E. (2006). "Unravelling the Cretaceous–Paleogene (K-Pg) Turnover, Evidence from Flora, Fauna and Geology". In Cockell, C.; Gilmour, I.; Koeberl, C. (eds.). Biological Processes Associated with Impact Events. SpringerLink. pp. 197–219. ISBN 978-3-540-25735-6. ^ McMenamin, M. A. S.; Schulte McMenamin, D. (1987). "Late Cretaceous Atmospheric Oxygen". Science. 235 (4796): 1561–1562. Bibcode:1987Sci...235.1561R. doi:10.1126/science.235.4796.1561a. PMID 17795570. ^ Kring, D. A. (2003). "Environmental consequences of impact cratering events as a function of ambient conditions on Earth". Astrobiology. 3 (1): 133–152. Bibcode:2003AsBio...3..133K. doi:10.1089/153110703321632471. PMID 12809133. ^ Keller, G. (2005). "Impacts, volcanism and mass extinction: random coincidence or cause and effect?" (PDF). Australian Journal of Earth Sciences. 52 (4–5): 725–757. Bibcode:2005AuJES..52..725K. doi:10.1080/08120090500170393. ^ Bosker, Bianca (September 2018). "What Caused the Dinosaur Extinction?". The Atlantic. Retrieved 2018-08-21.